JAN BROGAN - So this, the day after Thanksgiving, there are really only two things to talk about: What to do with leftovers - which we did yesterday, and Black Friday Christmas shopping. 2. When daughter complains it's getting late, allow her to do all the Christmas decorating. 3. Mean to send cards, but put it off so long that it becomes beside the point. If someone I haven't heard from in years from sends me one, rush to store and buy one single Christmas card to send in reply. 4. Ritualize Christmas tree shopping so that it is always done on daughter's birthday. This way she either reminds me or offers to do it herself. 5. Agree to make Christmas candies at the very last moment at daughter's urging. 6. Wait until the week before Christmas to start shopping. Thus run out of time before running out of money. 7. Recover from the materialism of Christmas by cooking a lot on Christmas day. For some reason it seems the perfect balm. The system is not for everyone, but it works for me. But as you may imagine, this system does not allow for Black Friday shopping. Have you every gone Christmas shopping on Black Friday and if so, why and was it worth it? Or do you have an alternate holiday system you'd like to share? LUCY BURDETTE: Oh Jan, your system would make me so anxious! What a lucky thing to have such a daughter to take over:). We are often traveling to see family or going to Key West or somewhere around the holidays, so that my preparations have contracted. One thing I can count on to help with the shopping list is the annual RJ Julia Booksellers member sale in November. I love this bookstore and love this sale, so a lot of presents are taken care of then! And I do collect stocking stuffers all year. HALLIE EPHRON: Shopping, sigh. Did you have to bring that up (she said, after returning from four trips to the grocery store and still needing to go back for another pint of heavy cream for Thanksgiving)? Black Friday. I have never, will never ever shop it. First of all, I hate crowds. If I have to go to the mall, ever, I go on a Monday morning when the place opens. And I'm home no more than an hour later. Plus our Christmas exchange is very modest -- mostly stocking stuffers which I try to pick up through the year, though this year I have almost nothing in reserve. My husband told me what he wants and sent me the link. It's purchased. And like Jan, I make candy. My son in law, whose family does exchange gifts, has a great system. He waits until Christmas eve and then heads out at dinner time to blitz it. It's like that old game show Beat the Clock -- what happens happens. JAN: He sounds sounds like my kind of guy. RHYS BOWEN: Life is much smoother since I discovered online shopping. Not only is it painless but they ship the presents to the right address. But I do send cards, around 100, since I like keeping in touch with friends around the world, and I love decorating. I have to confess that we finally got a fake tree. It looks wonderful but I miss the smell of fresh greenery. I also usually collect stocking stuffers all year but this year I have nothing! And it really bugs me when people want gift cards as presents. Nothing beats unwrapping a strangely shaped package, does it? And John is one of those who can't get into the holiday spirit until about December 23. Then he asks "What does everyone want for Christmas?" and by then it's too late to buy it at a good price online. HANK PHILLIPPI RYAN: Here's my 9-step system. 2. Plan to mail them. 4. NO! They can be New Years cards, all the better. 5. Missed that deadline, too. 6. Look on bright side, now I have cards for next year. 7. Put cards in safe place. 8. Forget where safe place is. DEBORAH CROMBIE: You mean it's Christmas already??? I'm not ready! I'm never ready! And I never never never ever shop on Black Friday. I can't think of many things I would less rather do. I don't go in department stores very often under ordinary circumstances--they make me feel overwhelmed by STUFF--so I can't imagine doing it on that day. I like to shop online or in my small local stores, and we don't usually buy big gifts. The Christmas cards are the tradition in our house. I think Rick and I have made our own cards every year since we've been married. (There was the year I'd had dental surgery and, totally snockered on Vicodin, hand-stamped a gilded pear--from a handmade woodblock--on a hundred cards...) Then we started doing photo cards, and not the family grouping, but really beautiful photos. The last couple of years we've moved the photo card tradition to digital and are using Paperless Post. I still buy a few paper cards to send to friends who don't have email. Who knows what we'll do this year? Maybe take up Hank's system? JAN: Hank, except for actually buying the cards, I totally endorse this system. Anyone else willing to share the holiday system that works for her/him? And whether it includes Black Friday shopping? ::SIGH:: You mean it’s Black Friday time again?? Black Friday . . . maybe it’s called “Black” because it’s so malevolent --- I despise pushy, rude crowds, haven’t got the patience to stand in line waiting to get into the store, and generally would rather be tucked in under a warm quilt than standing out in the cold at some ghastly hour when every sane person is home in bed . . . . I enjoy seeing the Little Ones open packages, so there’s always lots of stuff under the tree tagged with their names . . . I really love being able to surprise someone with an unexpected gift so I shop ahead. take full advantage of online shopping, and always shop the Hallmark ornament premieres [everyone knows to expect their favorite series pieces to show up under the tree], and shopping in the book store is one of the greatest delights of the season . . . .
I’m not a fan of giving gift cards [except for restaurant gift cards] . . . and someday I will actually get those Christmas cards in the mail [I hope] . . . . 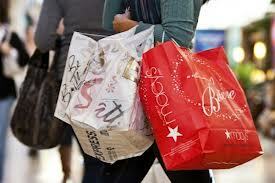 I love to shop, but I hate Christmas and refuse to go into a mall or most department stores in the holiday season. So I buy online or in small shops around town. Except for the kids, I give restaurant gift cards, which I usually pack up with a bag of gourmet coffee. Thank goodness we're all food and coffee addicts in my fam! I like to start the holiday season by re-reading David Sedaris' adventures as an elf at Macy's. It affirms that I'm not the only one who is a grump. Now I see you can listen to a portion on NPR. Yay! PS - I forgot. One year I sent everyone boxes of whoopie pies from an Amish bakery. That was fun! I have shopped on Black Friday many times (and will go out later today). It's a family tradition - my mom and her sisters have gone every year for at least 30 years, and they're out now. I went with them several times, but now I do most of my shopping online. While I hate the crowds, I honestly haven't experienced any rudeness. In fact, standing in line waiting to check out has generally been fairly pleasant because of conversations with those around me. The only time I've seen people get angry is when they've stood in line to get in to a store for an hour or more, only to have the store open and find there are only three of some big doorbuster item. I don't even bother with those anymore. I consider it a good Christmas when I don't set foot in a mall even once. I shop at local stores and online. One of my favorite kind of gifts is to get tickets to a concert or promise an afternoon at a spa for my best friend and me to do together. It's a treat for her and a time we can hang out. Once I gave my foodie son two tickets to a food-based tour of Boston's North End (the real Italian section). He took his girlfriend and loved it. But I'm usually a procrastinator, too, scrambling in the week before Christmas to finish up. Not a good plan! I can believe that. I have actually had good times in what would seem a hassle-like experience. I think there is something good that happens between people when they feel they are in the trenches together. I am a big David Sedaris fan, but did not know about the elf essay. I'm going to have to try to find it. Good Lord, NO!! My brother mentioned Black Friday to me about four years ago and I had no idea what he was talking about. I DO like shopping for gifts for people but it's the slogging around the stores and standing in lines that gets to me; due to long-time back problems, it is physically difficult. I've been doing more on-line shopping. There have been years when the cards just did not get sent. Maybe they were even addressed but I didn't get to the post office for stamps. I have enough cards at home that I probably have no need to buy any for a couple of years. Some years I deliberately send them the day AFTER Christmas. After all, the liturgical Christmas season has only just begun. I send cards only to people I rarely see. (When I start writing out the cards, I get a little teary about the friends and relatives who live so far away.) Last year I think I managed to get the cards in the mail by December 20th, a record for me. My office is open today but I took the day off, thinking that Thanksgiving dinner wouldn't be over until much later and that I would not get to bed at a decent hour. Turns out I could have gone in today. I will be steering clear of the shopping centers today and intend to just go to the library! Or start baking. Mother and I used to always do the Black Friday thing together, but never in a mall. When we lived in Atlanta we rarely went to the malls at any time, but there are a lot of wonderful little shops tucked in some lovely little funky neighborhoods we loved. We would always hit those and had a great time. Was it worth it? Money wise - I have no idea - I don't remember that we always bought anything, but we always had a great time. We don't do it any more, but don't miss it. It was one of those things we did and enjoyed, but its time, for us, has passed. We both still love getting together to shop though, and we both tend to pick up our Christmas gifts all through the year when we spot something that looks like the perfect gift for someone (especially when it's on sale!). Today, instead of shopping, I'm doing Christmas decorating around the house. I love Christmas. And I hope you all had a wonderful Thanksgiving - hugs all around! I'm pretty organized about the whole gift buying thing and do it year-round--this will shock those of you who know me, I'm sure--but what I really love is wrapping! Anyone else like to wrap while listening to Christmas carols, make pretty bows and unique tags, and make a bright, happy display under the Christmas tree? I tend to shop online, or locally, and not on Black Friday. Wrapping gifts with Carols playing, and egg nog handy used to be the family thing! I love this time of year! Wrapping presents might be one of those skills that skips generations, kind of like sewing. Because I spent several years as a buyer for a chain of specialty stores in the 70's, I detest shopping of any kind (well, except maybe books and fabric. and garden stuff). Being a buyer means shopping, either for the store, or fake-shopping at competitors' stores, about 75% of the time. The shiny wore off that one fast. Hank, thanks for accurately expressing the seven stages of Christmas cards for me, as well. Too funny. I still have cards I bought over 20 years ago. We also had tons of old cards that my mother-in-law had, way, way older than that. I finally matched them all up with envelopes, bundled them into plastic bags, and donated them to the Goodwill collection center a couple months ago. Jan, I like your system, but you can go one step further: Just assume, on Day One, that you're going to be at the final stage and just don't even worry about it until then. Why waste the energy feeling guilty over it? I wish I still liked Christmas, but it has become mostly an irritation. Traveling to visit family is a nightmare, and at home it doesn't make sense to decorate for my husband and me--because he hates Christmas, as does my son (who knows why). As for the original question about Dark, Evil Friday? Never, ever. Any shopping I do is strictly local--not exactly a sacrifice, since our local shops are fabulous. Hating Christmas seems unbearably sad to me. I'm so sorry. For 2 years in a row, I bought Christmas cards after Christmas in order to have a jump on next year and save money. I forgot about the stash - both years. So out of a clear blue sky I found cards ----they lasted for quite some time. And tomorrow, Saturday, is the day to shop at small businesses, local ones are best. It is a gift you give yourself and the business which may stay in business because of the income they make during the holidays. And finally, I have almost all the shopping done. I used hotel points - I had nearly 350,000 points. It was wonderful. Not shopping! But whoa, ANnette..you have this DOWN! Impressive! But I all admit..I LOVE to wrap. Do not do Black Friday. Rarely do "big box" stores or malls, although I do like "Home Goods." I am done shopping -- daughters get sweaters and some sort of kitchen doo-dad. I mail stuff to my sisters and mother. Children get simple stuff. All done with that. I do cards, including a Christmas family letter (which I allow my kids to edit). Near Christmas, I love music, stories, pageants, church -- this year going to the "Revels" in Boston, and "White Christmas" at the Kennedy Center, and "My Fair Lady," also in DC. I love, love, love Christmas. House is decorated. p.s. Not to be missed -- the David Sedaris essay about Dutch holiday traditions. I keep the cd in my car, and laugh myself sick several times during the season. I have to say I was a little bit intimidated this morning when I read this. With all the comments about things I'd never heard of before or had no idea what they were, if I had heard of them, I didn't know what to say. I remember being shocked, several years ago, by all the crowds of people shopping the day after Thanksgiving. I called my best friend to tell her about it. She said I'd been living under a rock and told me about Black Friday. That's the first I'd ever heard of it. Before that I think I just stayed put in the house with the family and - I don't know - did family stuff all weekend... played games; drank; ate turkey sandwiches on bread, spread with cold congealed gravy, stuffing, and cranberry sauce; watched old movies on TV... . I don't know what a Whoopie pie is. Now, after reading Edith's comment, I am wondering where the other Italian part of Boston might be. Really? There's another? You mean Eastie? I love being with family, especially Auntie-Mom and her gang, and don't mind traveling to see them. I enjoy it, because the thought of being with them and spending time together makes it worthwhile. I like going through the shared memories, even the bad ones, because we keep sorting it out and have become much closer because of it. And the drinking… did I mention that? I enjoy drinking and singing songs together. I like the party part. D&I use to exchange gifts, I think in 33 years he has surprised me twice, if I want something under tree I have to give a detailed list (preferably with pictures) or buy what I want, wrap it and tag it from Santa. I love the decorations but have found myself procrastinating more and more every year about decorating - we dont have much company here. When we lived in Fla, we always had people in and out - we use to walk in and out of each others houses on our street, only 6 of us and we all got together for snackies and drinks during the holidays. Moving to TN we dont have that and that I do miss. I use to make about 100 dozen cookies every year, a dozen or more rum cakes, kept 3 or 4 dozen for people popping over for a visit rest were given away, miss that too......in some ways I've become a grinch, hard to get excited about the holidays and decorating when you are the only one who looks at it and DH really could care less if decorations are up or not........MR. Scrooge himself, though he will put up outside lights for me as I do not do ladders - if he didnt, I'd hire someone, have to have outside lights. Somewhere in all that falls "BLACKFRIDAY" UGH I hate crowds, the internet was a great invention for Christmas shopping, and all year shopping for that matter, Black Friday falls in there with going to the mall the day after Christmas - went once, WHAT WAS I THINKING place was a madhouse, I lasted about 15 minutes and left. MERRY CHRISTMAS EVERYONE - I hope you all enjoy the season stress free!!!!! Leslie, obviously you don't know my family. You know, the underwear thing. Okay, and box store… what is that? Honest, I have absolutely no idea what that is.